As humans, our color vision influences everything from our art and poetry to the colors we paint our homes and the clothing we choose to buy. Yet, we rarely question the mechanics of our color perception — or what we may not be able to see. What Happens in the Eye? The eye is often compared to a camera. But it might be more appropriate to compare it to a TV camera that is self-focusing, has a self-cleaning lens, and has its images processed by a computer with millions of CPUs. Light from an external object is refracted as it moves through the cornea, and then moves on to the pupil, which is controlled by the iris. The light is again refracted by the lens, which projects an upside-down image on the retina, or the rear, inner surface of the eyeball. There, it is absorbed by pigments in light-sensitive cells, called rods and cones. These photoreceptors convert light (photons) into electro-chemical signals, which are then processed by neural circuits in the retina and transmitted to the brain. There are approximately 6 million cones in our retina, and they are sensitive to a wide range of brightness. 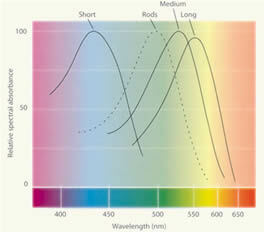 The three different types of cones are sensitive to short, medium and long wavelengths, respectively. Cones are active at high light levels and allow us to see color and fine detail directly in front of us. They can adapt to widely varying colors and illumination levels, but don’t work well in low light. Our retina’s 125 million rods are used only in dim light, and are monochromatic, so they don’t perceive color — only black and white. Rods account for our peripheral night vision, but don’t enable us to see well when we’re looking straight ahead. The three types of nerve cells that detect bright light span the “short,” “medium,” and “long” wavelength ranges. The retina consists of a very thin layer of nerve cells and contains two types of photoreceptors, rods and cones. Ganglions are also located in the retina. 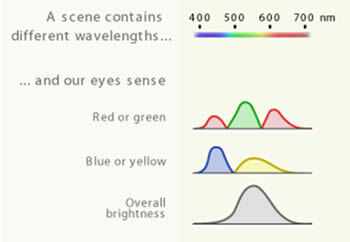 This graph shows the sensitivity of the different cones to varying wavelengths. But the cones in our eyes are just the beginning of the color story. 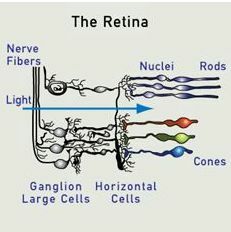 Ganglions are a type of neuron located in the retina that receive signals via various intermediate cells from the cones and rods. They are the cells that transmit information to the brain. Why all the fuss? The ganglion cells add and subtract signals from many cones. For example, by comparing the response of the middle-wavelength and long-wavelength cones, a ganglion cell determines the amount of green-or-red. Using ColoRotate, you can view colors in these three dimensions. Working in 3D makes colors blossom. Color’s 3D nature makes it difficult to accurately assess color on a flat paper or screen. With ColoRotate, you aren’t limited to moving colors around a flat color circle. Instead, you can explore all kinds of clusters and color arrangements. It’s fun, and it will give you new ideas for fresh and inviting color harmonies and color palettes. ColoRotate also allows you to define colors using slider controls for most color theories.